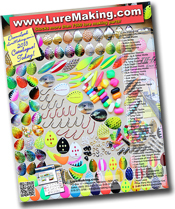 POWDER PAINT AIR BRUSH - Applying Powder Paint has never been easier! Requires air pressure of ½ to 1 cfm at 5 to 10 PSI. Can be used with even very small compressors. Suitable for both right and left hand use. 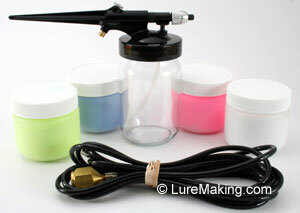 Kit # 75-30-22 includes one Powder Paint Air Brush, one 8 foot air hose, and one empty glass jar. * Same glass jar as included with the Air Gun. 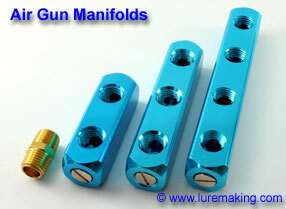 Use these handy manifolds when using two or more Powder Paint Air Guns or regular airbrushes. 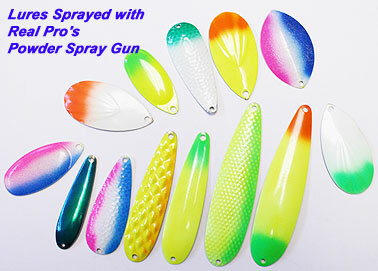 Saves having to change paint colours when painting your lures multiple colours. Manifolds may be ganged to increase the number of ports using additional npt fitting. 3 port manifolds are no longer available. Warm part to be painted in a preheated oven at 350-400 degrees F for 5 minutes. A small propane torch can also be used by holding the part with needle nose pliers or by hanging on a fine wire and moving back and forth over flame for a few seconds. Immediately after heating, hold or hang part sideways to allow spraying in a sweeping motion. The powder will adhere immediately and flow out to a smooth finish. If metal has cooled to the point where powder does not flow out completely, return piece to the oven or wave back side of piece over torch flame until desired effect is achieved. More paint can be added as necessary. For maximum durability, hang piece in oven for 10 minutes at 350 degrees F.
Unused powder can be left in covered jars. To change colours, simply blow out plastic tube and attach new jar. Fill jars only half full for best results. 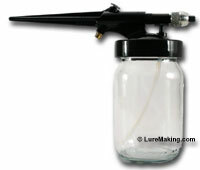 Glass jars (available seperately - item # 75-30-05) may be attached directly to the Spray Gun. To eliminate dust, work in front of a cardboard box, lying on its side, with a shop vac hose inserted into the lower back corner of the box. The air flow created by the shop vac will keep powder in the box. Always use in a ventilated area.